Oh! I didn't realize the inside could be inhabited by monsters. In that case, I also agree with the fast fade. perhaps you can somehow dim the outside? 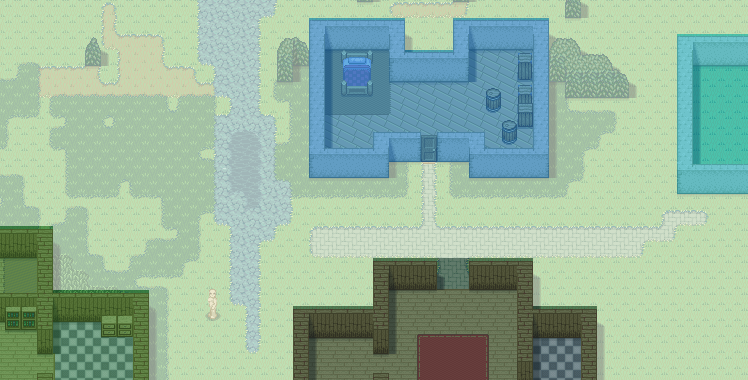 Yes, a pixel aRPG where it doesn't load when you go in a building. Completely revolutionary! Maybe too far ahead of it's time. You could probably fade the blocks as they disappear, though, so as to not offend the sensitive eyes of those born after the turn of this century. Welcome to the thread! There was a WEEEEE bit of sarcasm in the claim this game is "revolutionary." I don't think anything is state-of-the-art in this game. Dragon Warrior Monster had a roof system too, and that ran on the gameboy's 4.19 MHz processor! @amanfr01, Geoff Moore and everyone else who seconded the idea for a transparent black, good idea! Total black is too much. I tend to think in extreemes. And finally, I turn on the layer and apply the shader when indoors. And that's my weekend! Hope this pleases your eyes. Appreciate any feedback. I really like the fading of the roof and outside world. Maybe sync the fade out of the roof with the fade in of the world though? The art style is great. Wish I had your skills. The living world is a big positive for me too. Is the world a fixed size or generated on the fly like minecraft, factorio etc? I use procedural generation heavily in my game so I'm interested in how you use it. Thanks for commenting on my dev log, I'll keep an eye on Pale Meridian too. also, that man looks like a golem in my opinion, as others have stated. maybe add proper facial features, clothes, etc? Well Forstride, after trying a few color tweaks I ended up changing pretty much every color in the spectrum... (Except the night sky ironically) Behold! They're SUPER different, but I'm not sure if it's better. Can I get opinions? If you prefer one to the other, how strongly do you prefer it? Maybe a mix of the two? Maybe something else completely? I know I'm a little late here, but I think you should consider a mix of the two. The idea that things clash helps certain things pop. The over saturated top image is pretty hard to look at with all of its intensity, but I think that kind of saturation and those awkward colour ramps are nice to keep in your pocket for when you want your RPG to get a little weird and funky (witch's house? poison swamp? etc.). The house fade in/out is looking great!!! Sorry for late reply. Christmas and all. I actually went for a mix-ish. Here is an updated color scheme. Last image is current. May still need changes. There's that dang golem again! He obviously needs something. Glad you like the game otherwise. 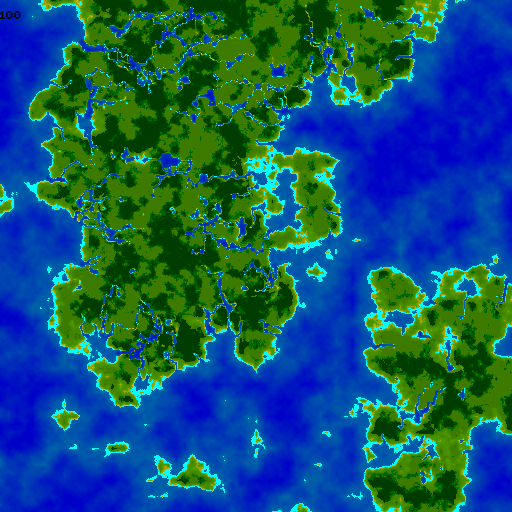 The world is a fixed size and WAS procedurally generated to use as a base. (I draw on changes as I need them, so the end result will be mostly non-procedural) ProcGen is just too daunting a task for a heavy storyline. 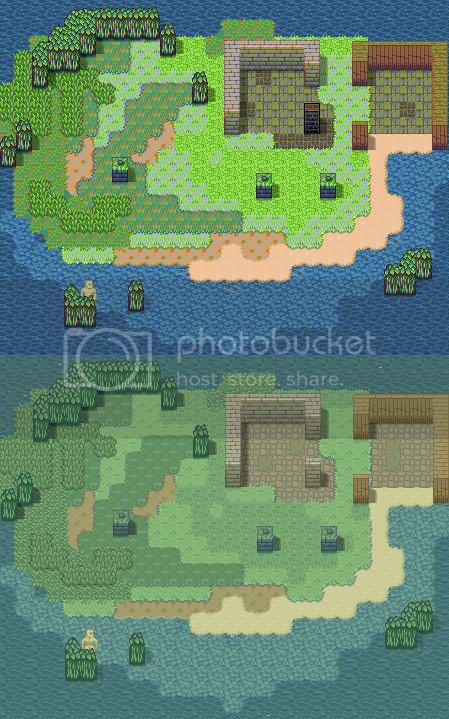 Here are a few images of the original procgen. I like smooth maps, so I was immediately drawn to it. Nope, no online programs used. It was made in house. 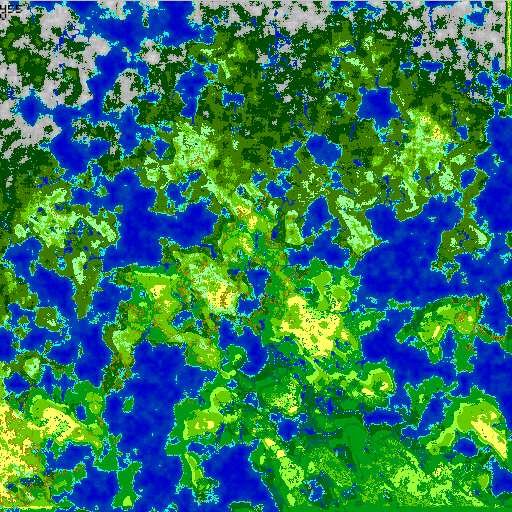 Standard midpoint displacement with some river/biome generation. In the long run I probably should have just used something online since I took WAAAY too long making it work. Uh... Thanks for the unusual advice. Luckily, you caught me right when I was thinking about implementing them. @amanfr01: Glad you like it. On the development side, I've been doing lots of boring stuff. Inventory, pathfinding, and AI. Nothing really cool to show, but definitely needed. AI was previously a jumbled mess of half FSM and half complete rubbish. I switched to a behavior tree style and the code is SOOO much cleaner, shorter, and easier to add too. Strongly recommend behavior trees over FSM's for any somewhat complicated AI. 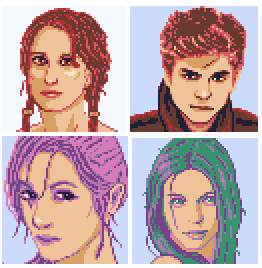 Here is some of the art I've been working on, 64x64 portraits for ingame NPC's. And thats it! Love any feedback. They look fine (and what's wrong with a bent nose, anyway?)! The whole project looks darn-diddly-dandy. I like the most recent colour scheme too, and I agree that you should synchronise the roof fade with the outside fade, which you don't seem to have addressed yet (no rush, tho!). I don't think I like the smooth fade around the outside fade, tho. I think it should be darkened perfectly around the house. Additionally, it's nice to see the collision and stress tests! Holy crap! I'm really digging the sense of "modernism" in the NPCs. Wasn't expecting that at all. Another roof related question. While indoors, should the outside go black? Perhaps just dim the outside using some kind of gradient circle. Just determine how big the building is, and draw dimmed circle bit outward from there. Might give a nice "can see out the windows a bit" feeling or something, yet still feel cozy. The upside is that if there is motion or sounds coming from outside, you can see the source and feel like you're still in the game world. Nevermind, you already did something like this, but snazzier. Nothing wrong with an intentional bent nose, but I don't want one by accident! Smooth fade around the house would be super easy to enable/disable. I may include an option for both. I'm really digging the sense of "modernism" in the NPCs. Wasn't expecting that at all. I don't want to give everything away, but expect some surprises in the future. "Ancient" temples will be pretty cool. Also tomorrow I'm going to China for two weeks so things will be quiet. Hopefully I will have an update when I return.